Do you shop online? If you’re looking for the best deals on your favorite products, AliExpress is a great site. 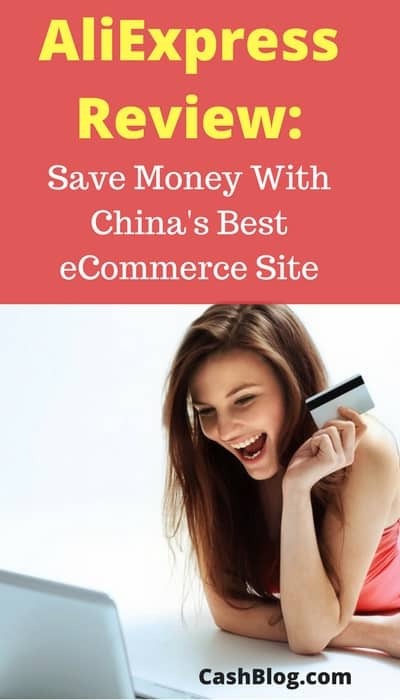 It allows you to take advantage of the cheaper cost of goods in China. And, with many sellers offering free, fast shipping, there’s never been a better time to checkout what the orient has to offer – direct to your doorstep. This AliExpress Review is my attempt to help you safely try something new. You’ll find that it’s possible to save money by safely shopping overseas. And, with all of the coupons and promotions, it’s almost impossible to spend too much. I’ll cover how you can use the site to complete your first AliExpress purchase – from searching for your item, to payment and order tracking. We’ll also take a dive into how items are shipped quickly and reliably overseas. If this is the first time you’ve heard of AliExpress, you’re not alone. More than $229 billion will be spent on online advertising in 2017. With all that noise, it’s hard to find new things that are relevant to you. So, let’s cut through the noise and take a closer look at AliExpress! Why is AliExpress so Cheap? What is AliExpress Standard / Premium Shipping? Which countries do XYZ ship to? 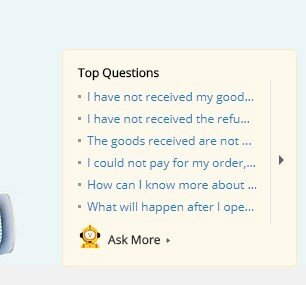 How can I pay for my AliExpress order? How do I avoid International Transaction Fees When Purchasing from AliExpress? Where can I find coupons for shopping on AliExpress? Do you feel comfortable trying AliExpress for yourself? AliExpress is an online platform that connects Chinese retailers with businesses and consumers around the world. By operating in a more cost-effective environment, Chinese retailers are able to offer an endless selection of affordable goods and services to overseas buyers that are looking for individual items, as well as large bulk orders for reselling. The site is currently owned and operated by Alibaba. Annual sales usually exceed 4 to 5 billion dollars. AliExpress is separated from Alibaba’s main site by the distinction that sellers on the platform may only sell their products to buyers outside of China. Because items are shipped overseas, shipping can take 60 days. Shipping costs can also be in the thousands of dollars. But, if you’re not in a rush, you can find affordable items with free shipping – helping make the site more accessible to traditional online shoppers. It’s also important to understand that all of the sellers on AliExpress are independently operated. Similar to other online stores, it’s important for buyers to check the profile of the seller they’re interacting with; check reviews from previous customers and be sure to carefully read product descriptions to ensure a great experience. You can feel confident purchasing products on AliExpress because of their buyer protections. These include a money back guarantee for returned items, as well as an option to accept a partial refund for items that weren’t as described, but cannot be conveniently returned by the buyer. The dispute process is completely managed by AliExpress – ensuring a fair and competent resolution. If you’re visiting AliExpress for the first time, I’m here to help! By reading this section of the guide, you’ll learn how to complete your first purchase. I’ll go into further detail on the various aspects of finding a great seller, and what to expect after you make your purchase in the additional sections below. Because AliExpress is designed for buyers on every continent, their site is available in multiple languages. To find the site version that will provide you with product descriptions in your language and prices in your currency, click on “languages”. A dropdown will appear and you can select your preferred language. To change the currency, click on “Ship To / USD” in the upper-right hand corner (illustrated above). You can select where you would like your purchases to be shipped to, and which currency you prefer to pay in. Once you’ve configured these options, you’ll have accurate pricing and product descriptions in the language you’re most comfortable with. If you’re anything like me, you have a general idea for what you want when you shop, but you’re not sure exactly what you want. Browsing categories is the easiest way to experience all of the endless options that AliExpress offers, thanks to their huge network of Chinese retailers and manufacturers. On the left-hand side of the homepage, you’ll find AliExpress’ general categories. By clicking on one of the categories that’s relevant to you, a list of sub-categories will pop out to the right side. You’ll find current sale items, as well as a variety of focused categories designed to fulfill more specific needs. You can also view items based on the brand names that you prefer. In addition to categories, if you already have a solid idea of what you’re looking for, you can use the search box at the top of the page. Just like Google, you can type in a short description and scan through the resulting items. I’ve found that selecting a category to search within, using the dropdown to the right of the search box, greatly improved the results – helping me find what I was looking for a lot faster. AliExpress does a phenomenal job of translating the major elements of their platform into a variety of languages. However, some of the independent sellers fail to provide high-quality translations of their product listings. To get around this, I found a powerful tool built into most online browsers: “Translate This Page”. I prefer Google Chrome, so I will cover the process for translating a page in Google’s flagship browser. If you are viewing a page with some content in a foreign language, you can right-click on the page and select the option to translate the page to your native language. While it isn’t perfect (a computer is only so good at translating slang and specialized phrases), it’s much easier to navigate. As you scroll through the list of available products in the category that’s relevant to you, feel free to add a few items that peak your interest to your cart. You can always remove the ones you don’t need after you finish comparing your options. How many reviews are there from previous customers? A reputable product listing will have at least a couple hundred. Anything less, and you’re looking at an item that may be relatively unknown in the marketplace. What is the average rating? A product with an average rating above 4 stars is generally a safe bet. The color of the item is a key section in every product listing. This helps ensure that what you’re looking at in the product’s picture is verified for color accuracy. The discount price is the cost for purchasing the item from the retailer. This number may change as you increase or decrease the quantity of the item in your cart. Motivated sellers will offer attractive bulk discounts for larger buyers. Before you can add an item to your cart, you must select the size. Scroll through the product listing to see if a size chart is offered so that you can feel confident about fit before hitting the buy button. The guarantees outlined by the seller, and backed by AliExpress, will give you a firm idea on when you can expect delivery of your item. You’ll also be able to rest assured that the item you’re looking at online is the same as the item you’ll receive at your front door or loading dock. If things are not as expected, this guarantee section will outline whether or not you’re entitled to a refund. When you’re ready to purchase an item on AliExpress, you have two options. 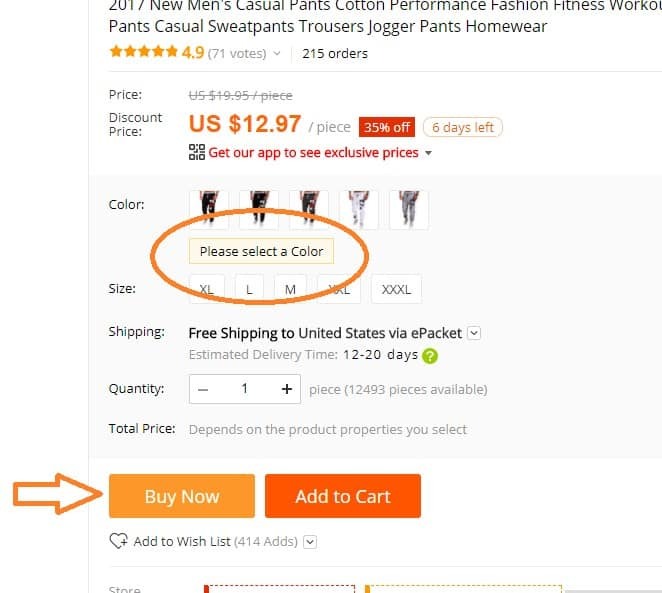 “Buy Now” is the button you want to click if you want to immediately checkout with your chosen item. Just make sure that you’ve selected the color, size, shipping method and quantity before clicking “Buy Now”. Otherwise, you’ll get an error message. I had a hard time identifying why the “Buy Now” button wouldn’t work the first time I went to use it. In the screenshot below, I’ve highlighted an error message that will alert you to the specific selection that needs to be selected in order to continue with your order. The “Add to Cart” button will allow you to continue shopping for other items – saving your chosen item in your cart. 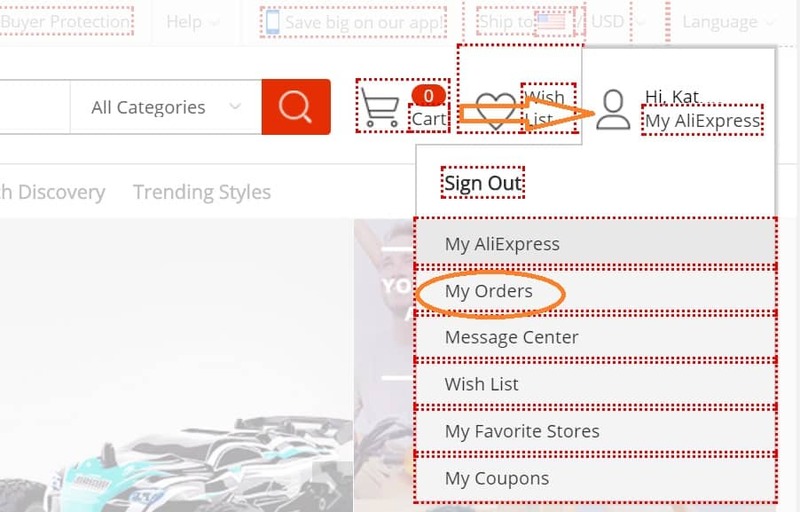 After you’re done browsing, it’s time to finish your transaction so that AliExpress and their partners can get busy fulfilling your order. You’ll first need to fill out your personal information, including shipping address. It’s important that this address is in the same region you chose earlier, when selecting language and country for browsing the site in Step 1. 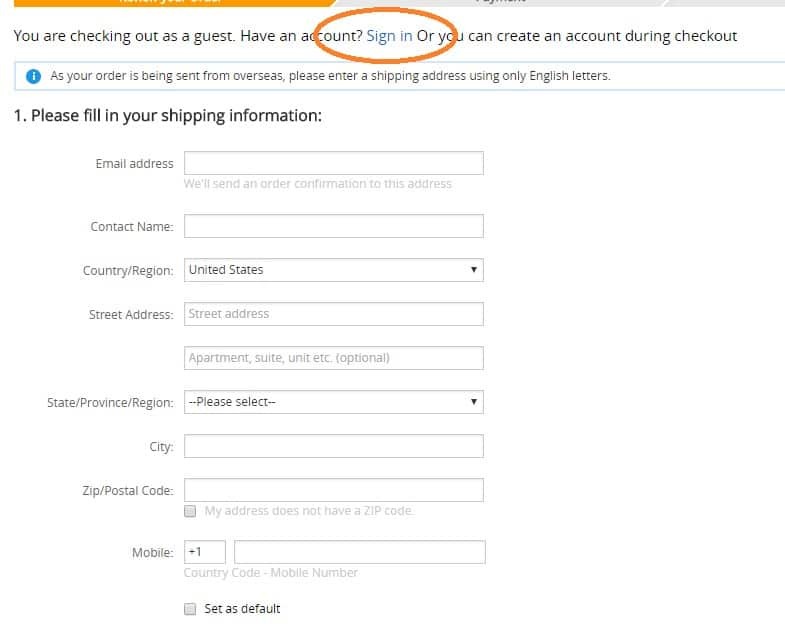 You’ll have the option to sign into your AliExpress account. If you don’t already have one, you can create one while checking out as a guest for the first time – or select the option to remain as a guest if you don’t want to create an account. Next you’ll need to confirm your shipping address and the items in your cart. This will be your last opportunity to change quantities or remove items. If you have a specialty request, you can leave a message for the seller of each individual item. AliExpress accepts electronic bank transfers, Western Union, Visa, MasterCard and American Express, as well as gift cards that allow international order processing (more on that in a moment). After you enter your payment information, you’ll have the option to save your payment details for faster checkout in the future. You’ll also want to double check the specific AliExpress Buyer Protections that you’re entitled to as part of your order. Different merchants on AliExpress choose to honor different AliExpress policies when they list their items. A full refund for items that fail to arrive. I can return any time that isn’t as described for a full refund (I would have to pay return shipping). I can also choose to keep items that weren’t as described and accept a partial refund. To better understand how these policies work, you can learn more on the AliExpress Buyer Protection page. 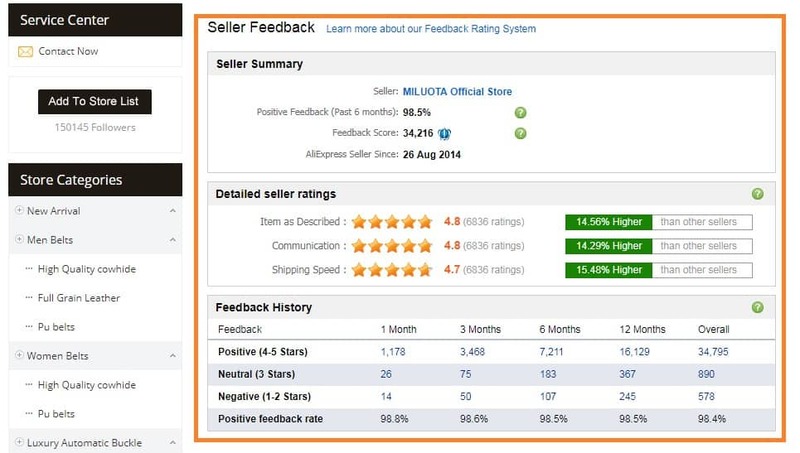 You might be tempted to compare AliExpress to Amazon. And, you wouldn’t be completely wrong. Both are eCommerce sites with massive market share. There are more than a few differences though; the biggest of which is that AliExpress is part of a Chinese conglomerate, and all of the items come from Chinese retailers. Amazon is based in the United States and has sellers from a multitude of countries. Because AliExpress’ products are shipped from China, shoppers have to be comfortable with the ins and outs of buying items and having them imported into their country. This involves working with shipping companies that you may not be familiar with, and working with retailers you certainly are not familiar with. Shopping on AliExpress may involve paying customs and other fees charged by your home country – this varies greatly depending on the products you purchase. For example, electronics are almost always tagged with fees by customs. Other goods seem to slip through the cracks more often than not. Of course, order quantity also has a big impact – if you purchase 100 DVD Players, you’re going to be a bigger target for customs than someone purchasing a single Beanie Baby toy. Shipping takes significantly longer on AliExpress than Amazon. Amazon’s warehouses are located around the world – designed to offer faster shipping to consumers. However, many Amazon sellers ship from their own home to save the storage and handling fees Amazon would charge them. AliExpress relies exclusively on the sellers on their site to warehouse products and fulfill orders. And almost every product is going to come from China – there are a few exceptions, but you’ll see item availability, by region, on the product details page (see screenshot below). Both Amazon and AliExpress allow sellers to list their products on their platform. Amazon has in-house products that they develop and sell on their site, alongside independent sellers. AliExpress is 100% stocked with products from independent sellers. One major difference is that AliExpress only allows sellers from China to list products on their site. Amazon has a large contingent of Chinese sellers on their site, but they are open to anyone, regardless of nationality. Because both sites have transparent customer reviews and seller profiles, you can shop safely on either platform; as long as you use common sense. While Amazon offers a variety of benefits for their Amazon Prime Customers, this costs an extra $99 per year. AliExpress treats every customer exactly the same, without requiring them to sign up for a paid membership. And the number of discounts and coupons available makes their already cheap prices almost unbeatable. Alibaba is the parent company of AliExpress. 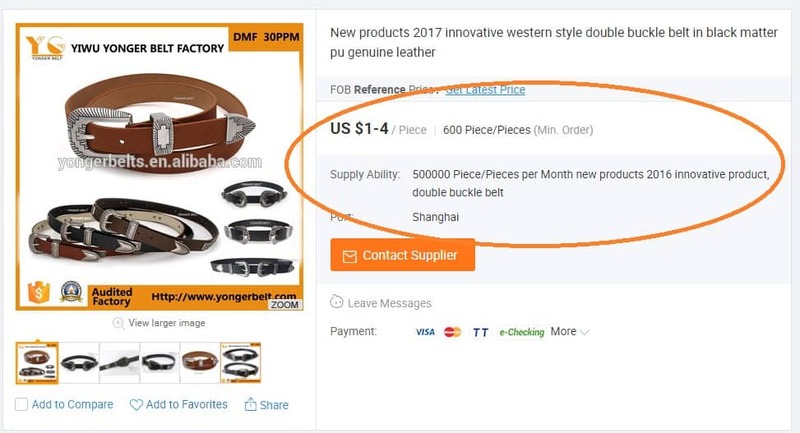 Alibaba’s website is designed for large resellers, or people that buy in bulk, to connect with suppliers and manufacturers in China. AliExpress allows smaller purchasers, including individuals, to purchase items from China at factory-direct pricing. If you’re a large buyer, you may find better deals on Alibaba (but not always). Individuals that want to purchase a single item cannot shop cost-effectively on Alibaba. Below, you’ll find a screenshot of an item for sale on Alibaba. A couple of things should jump out at you – especially after reading the AliExpress User Guide above. The minimum order size for this item is 600 pieces. And, the price of the item goes down, depending on how many you order at a time. You’ll notice that this manufacturer is able to handle orders of up to 500,000 belts. That’s half a million belts! Clearly, this listing is designed for a large retailer to make a bulk purchase. You can’t complete your purchase with a simple click, like on AliExpress. Instead, you have to contact the supplier and negotiate / confirm the rate they’re offering. Instead of a few minutes on AliExpress, an Alibaba order can take days of negotiating and confirming details. It’s important to understand that AliExpress is giving overseas buyers unprecedented access to Chinese retailers. With changes to how international shipping is handled, it’s now much more cost-effective to shop overseas for the items you need. Just remember to factor in the potential customs fees for importing an item from overseas – in some countries it’s as much as 30% of the value of the item. If you do need to pay these fees, they’ll be collected by the shipping service after the item is process by the relevant border agency. If a brand name item is significantly cheaper than elsewhere, there’s a possibility that it could be a counterfeit. Or, it could be an overstock item that a Chinese manufacturing company didn’t deliver as planned. Use common sense. Anytime you’re purchasing a brand name item, it’s best to look for an item on AliExpress that comes with their “Guaranteed Genuine” guarantee. If you receive a counterfeit item, you’ll be entitled to a full refund (including shipping costs). BUT, this is not offered on every time, so pay close attention to the product listing. A lot of our visitors wonder if AliExpress is a scam that’s just too good to be true. Thankfully, for fans of saving money online, that’s not the case. Alibaba, AliExpress’ parent company, did nearly $23 billion in their most recent fiscal year. AliExpress is a significant portion of that revenue. They’ve been able to achieve these earth-shattering revenues by providing a safe online marketplace for suppliers, wholesalers and consumers to connect. They are currently the fifth largest online retailer in the world. The company is publicly traded on the New York Stock Exchange with the symbol: BABA. AliExpress is definitely not a scam site. Their parent organization has operated in a professional and reliable manner since their founding in 1999. And Jack Ma, the company’s Founder, is one of the most respected leaders in the international eCommerce space. One of Alibaba’s most popular features is their Trade Assurance Program. This provides merchants with access to reputable product vendors – backed by Alibaba’s guarantee that the transaction will go smoothly. Because the entire transaction is performed within Alibaba’s ecosystem, where they have total oversight and control of escrow, the supplier is held to a higher standard. And, if things go wrong, Alibaba has a team of resolution experts to help get things back on track – or refund the buyer’s money. A full refund if you don’t receive your order. Domestic Returns for any product that isn’t needed. It must be unused, in original packaging. This is most popular with smaller businesses that are nervous about having inventory that doesn’t move. Unsold inventory in original packaging can be returned for a full refund – ensuring greater control over inventory costs. 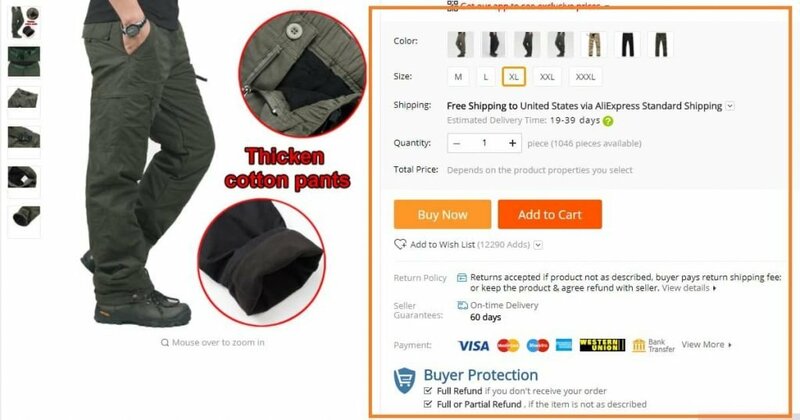 Guaranteed Genuine means that if a counterfeit item is received in a shipment from a supplier on AliExpress, the buyer is entitled to a refund of the cost of the item, as well as return shipping costs. These policies are fully enforced by the AliExpress customer service team. Even with the power of Alibaba behind it, there’s no such things as a perfectly secure eCommerce site. The internet just has too many threats to catch every single one. In this section, we’ll look at a few previous security incidents that involved AliExpress. In 2012, it was reported that 55% of sites suffered from XSS vulnerability. This was an issue AliExpress was alerted to in 2011. The reason an XSS vulnerability is so scary is that it means a bad guy can insert code into a form, or other executable text field on the site. This code, once processed by the victim site, would connect with the bad guy’s server and allow them to execute all sorts of malicious code. Once AliExpress realized they were vulnerable on both their site and mobile app, they resolved the issue within 6 weeks. According to The Wall Street Journal, there were vulnerabilities in the site that allowed hackers to change the price of items, shutdown AliExpress seller stores, change shipping details, and allow hackers to view customer addresses. AliExpress issued a statement advising customers and sellers that the security vulnerabilities had been patched, and no personal customer data had been successfully leaked. Both of these publicly reported incidents were handled quickly and no massive leak of customer data was ever reported or confirmed. AliExpress is very safe, as long as you use AliPay and check the seller’s profile for reviews. And, as with anything in life, if it’s too good to be true, it probably is. In the section below, I’ll cover how to assess the reputation of a seller on AliExpress. But, before we jump to that, let’s cover a few steps you can take to avoid fraudsters. Look for sellers that have been on the AliExpress platform for more than a year. With less than a year, it’s hard to collect enough reviews to know for sure that you’re dealing with a quality seller. Double-check to make sure that the item you’re looking at is covered by AliExpress’ Buyer Protection program. You’ll see the badges for this at the bottom of the product listing. (See the screenshot above in Step 7.) Virtually every product on AliExpress is covered. In fact, I haven’t personally found one that isn’t. But there are additional optional protections that the seller can offer: “Domestic Returns” and “Guaranteed Genuine” are important for certain items. Read through reviews from previous customers. Don’t just look at one or two. Really dig in and read 10-20 before hitting the buy button. And, it’s always wise to look at reviews from different periods of time. Feel the seller out by sending them a message and seeing how they respond. Does their communication inspire confidence? Hold off on opening disputes until you’ve received your item. This one’s really important. If you open a dispute and the seller is able to prove “it’s in the mail”, then the dispute will be resolved by AliExpress. You are limited on how many times you can dispute a transaction. So, it’s best to hold off on opening a dispute until you have the item in hand. If you’ve already disputed the transaction and it’s been resolved before it arrives, if there’s an additional problem after it arrives, you may be out of luck. Take your product for a test drive before marking “delivered”. 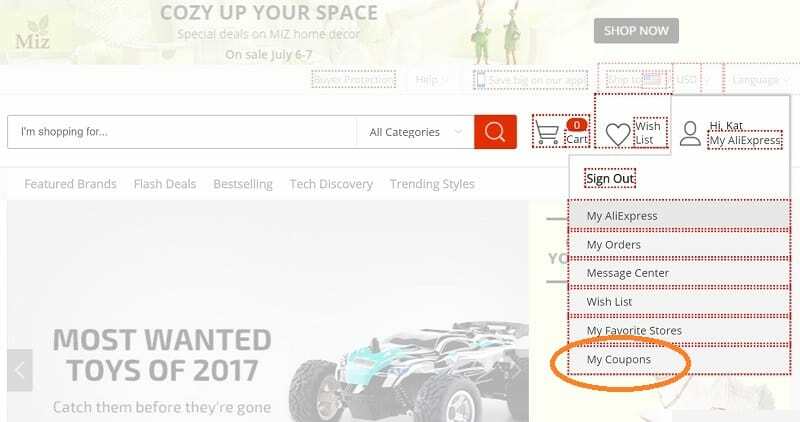 AliExpress wants to ensure you’ve received your product, so you’ll be prompted to mark the product as successfully received in your account. Take a few days and try out your new product. Make sure it’s exactly what you were expecting. It’s much harder to get a resolution to an issue after the item has been marked as successfully delivered. AliExpress is an online platform with thousands of sellers offering their products and services to businesses and consumers. It’s important to understand that sellers are independent of AliExpress. This means that each seller on the platform has their own reputation, customer review history and policies. To find the best sellers to buy items from on AliExpress, there are a variety of things you can dig into. The percentage of feedback in the past 6 months that was positive. Did the item you received match the online description? How easy and reliable was communication with the vendor? How fast was the item shipped? You can click on “Ask More” if your question isn’t listed. Then, an intelligent chatbot named Eva will attempt to answer your specific question. The quick video below shows an interaction I had when I asked her if AliExpress was like Amazon. At the end, I was able to choose whether or not my question had been resolved. If I didn’t feel that my issue was fully resolved, I had the option to click on a direct link to AliExpress’ live chat. 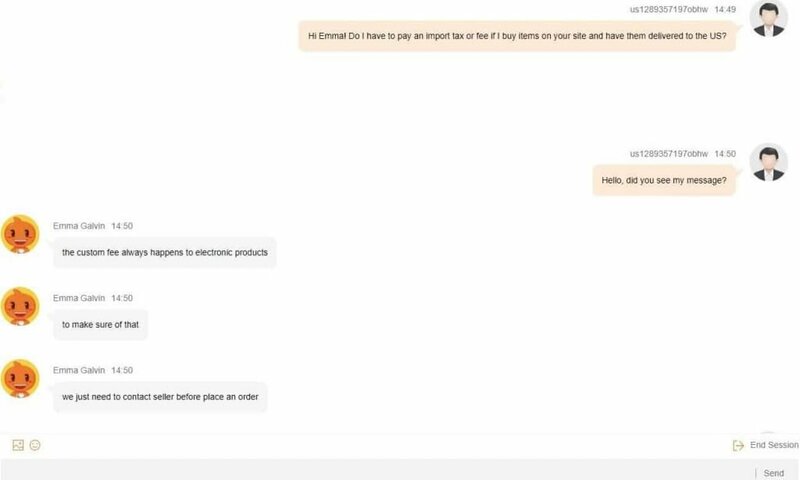 AliExpress’ chatbot was very helpful and could handle a variety of questions, without forcing me to wait in a support queue. But, for some things, you might feel more comfortable chatting with an actual human. Step 1: Click “Customer Service” from the “Help” dropdown at the top of every page on the AliExpress site. Step 2: Scroll down and click on “Chat Now” in the “Contact Customer Service” section. Step 3: You will be connected with a chat support rep after answering a few questions to describe your issue. When the chatbox opens, simply type in your question. In many cases, shipping an item that you purchase on AliExpress will be free – with shipping costs covered by the seller. But, this isn’t always the case. It’s important to check the shipping options for the item that you’re looking at. Most sellers are willing to cover shipping via specific logistics companies. If you click on the shipping dropdown for your desired item, you’ll find a list of available logistics companies that can deliver your item to your doorstep, along with their estimated fees. How quickly can they deliver my item? Have I heard of the shipping company before? How much do they want to charge to deliver my item? Will they allow me to track the shipment online? You may have noticed that AliExpress offers their own shipping service. There are two options – Standard and Premium. Based on my experiences, I recommend avoiding AliExpress Shipping. You’ll find that the items they ship are contracted through local postal carriers and, to save money, their shipments are sent with the lowest priority possible. This means you are far more likely to experience a shipping delay if you ship your order through AliExpress’ shipping service. 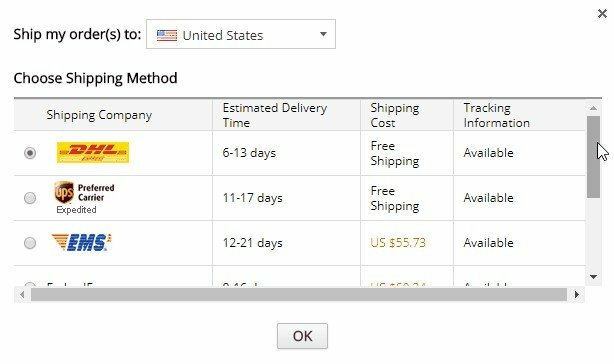 If the speed of delivery isn’t important to you, then I’d definitely save money and go with the cheapest option, which might be AliExpress’ shipping service. But, if you want or need your item within a specific time window, I’d recommend a more reputable shipping service. There are a lot of options for shipping items on AliExpress. I personally recommend using the same logistics company each time you shop on AliExpress. Over time, you’ll feel more comfortable with how your chosen company operates, and you’ll know that you can depend on them based on your personal history with them. You might already have a company you prefer to ship your items through. Unfortunately, if you love the US Postal Service, you’re out of luck – every item from AliExpress comes from an international warehouse. So, you’ll need to establish a relationship with a reliable international logistics company. Below, I’ve listed many the major shipping companies that AliExpress sellers usually work with. You’ll also find a link to their coverage maps. In the list above, every logistics company is a major brand. DHL, UPS and FedEx are recognized global leaders in the shipping industry. EMS was setup in 1980 by state-owned China Courier Service Corporation (CCSC). A lot of shippers prefer shipping items via EMS because China treats their state-run shipping outfit more favorably – especially in regards to inspections and additional fees. And SPSR is the leading private shipping firm in Russia. Unless you’re an ecommerce veteran, ePacket may be a new term to you. The shipping program was an initiative launched in partnership between HongKong Post, eBay China and the US Postal Service. The program’s goal was to boost ecommerce shipments from China to the United States and other major consumer nations. The program has been a massive success – allowing smaller items to be shipped internationally via USPS’ First Class Mail service. Weighing less than 4.4 pounds. Maximum length of shipment is 24 inches. The combined length, width and thickness of the package cannot exceed 36 inches, total. I enjoy using ePacket delivery for small items because the delivery time is relatively reliable (usually 10-20 days), and the costs are significantly less compared to other major shipping firms. On AliExpress, most of the items that qualify for ePacket delivery will not even provide the option to ship with another carrier – they’re simply not cost competitive. If you’re anything like me, once you’ve completed the checkout, you can’t wait for your item to arrive. AliExpress feels your pain, and makes tracking your order progress very easy. Hover over your name, in the upper-right hand corner of the homepage. This will allow you to view the options associated with your account. Then, click on “My Orders”. You’ll find a listing of all of your current and past AliExpress orders. Click on the order you’d like to monitor and a “Logistics Information” screen will appear. If your order has shipped, you’ll see a tracking number that will allow you to monitor your shipment’s progress. Most items can be tracked without leaving AliExpress’ site. But, if you want comprehensive details on your shipment, I recommend using the tracking service provided by the company handling your shipment. You’ll be able to access estimated delivery dates and times. And, if your shipment will incur a fee or duty from the customs agency in your country, you may be able to pay for this fee online – expediting shipment to your home or business. 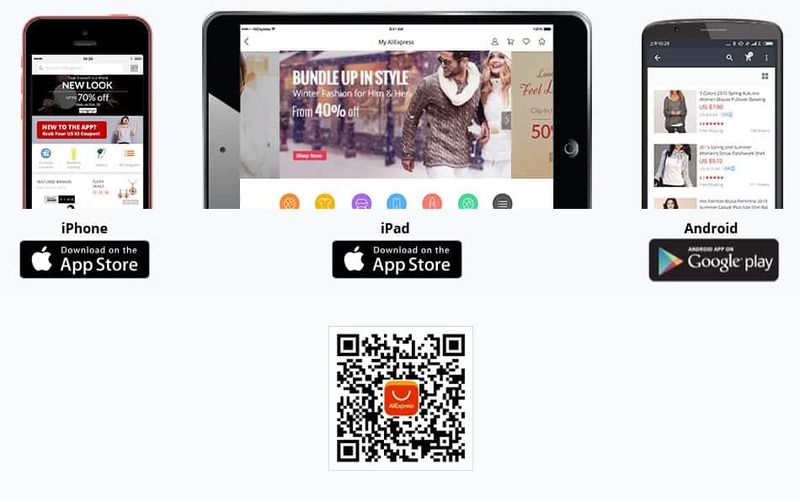 AliExpress allows shoppers to pay for their order using multiple payment methods. Almost every major credit and debit card is accepted. You can also send a direct wire transfer via WesternUnion and other similar services. It’s very important that you process your payment via AliExpress’ website. If you and the merchant negotiate an agreement and you pay for the item outside of AliExpress (like a PayPal invoice or electronic funds transfer directly to the seller’s bank account), you will have little to no coverage through AliExpress’ buyer protection programs. Depending on how you pay for your AliExpress order, your bank may charge you an International Transaction Fee (ITF). These fees are not charged by AliExpress – they are charged at the sole discretion of your banking institution. *Pay careful attention to the terms and conditions for any financial product you choose to open. Sometimes there are limited time periods where fees are not charged for international transactions – make sure you understand the risks associated with using a new payment instrument to complete your transactions. No, you cannot use a standard PayPal account to pay for transactions on AliExpress. This is because PayPal charges fees to websites that want to use them as a payment gateway. For a smaller site, this isn’t such a big deal. But AliExpress processes billions of dollars each year. It’s more cost-effective for them to process transactions through their own systems, which offers similar protections to buyers. One way you can still use the funds in your PayPal business account to pay for your AliExpress purchase is by applying for a PayPal Business Debit Card. This debit card is serviced by MasterCard on behalf of PayPal, and the funds are pulled directly from your PayPal account. You also have the option to link a backup bank account in your PayPal account, so that you can pull funds directly from your bank to cover your PayPal debit transactions. AliExpress’ parent company, Alibaba, created a payment processing system called AliPay. More than 50% of all online transactions in China are handled by AliPay. The program boasts more than 350 million registered users. 90 Days of Payment Protection – Giving you time to detect fraudulent transactions and report them with confidence and peace of mind. A dedicated fraud prevention and response team – both monitoring and responding to fraud on your behalf. There are no additional fees associated with using AliPay. For transactions processed using AliPay on AliExpress, funds are held in an escrow account until the transaction is completed. This protects the buyer from losing their money to a fraudulent seller. And, it gives AliExpress the ability to guarantee payment to the vendor – giving them the confidence necessary to complete the transaction. Yes! 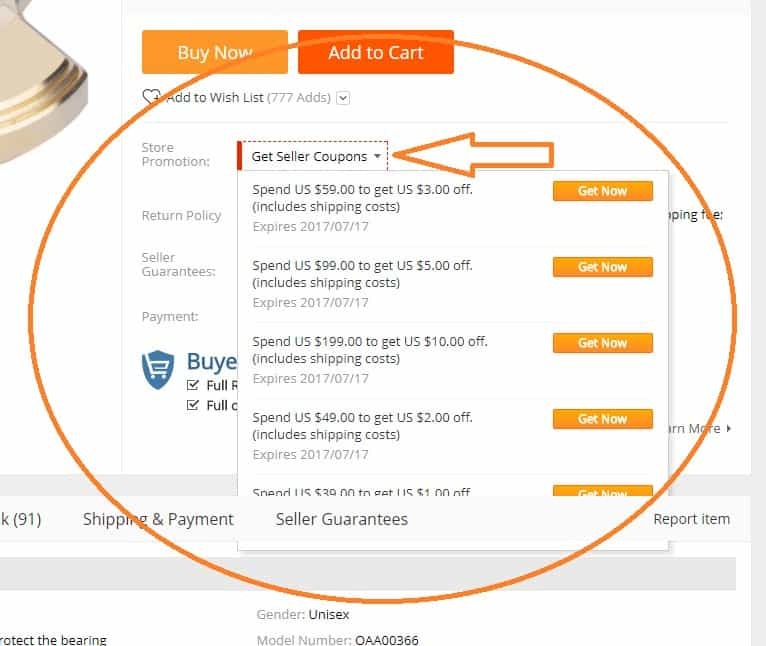 You can save a boatload of money by cashing in on the coupons that AliExpress makes available to their shoppers. Some of these coupons are offered by sellers or brands that want to promote their items. Others are offered directly from AliExpress. One of the best ways to access AliExpress’ coupons is by using their mobile app. You can download the AliExpress mobile app from the Google Play Store or the Apple App Store. 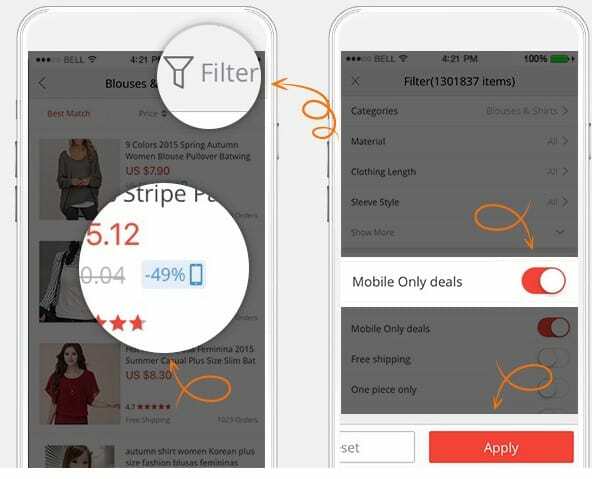 You can use the same method to filter deals based on free shipping, or the most important characteristics of the product you’re purchasing – for example, you could filter clothing by size, color or style. Many deals can be found directly on the AliExpress website. For example, on the AliExpress homepage you’ll find an entire section dedicated to “Flash Deals”. These are limited-time discounts on some of AliExpress’ most popular products. When you select a Flash Deal, you’re guaranteed that this is the best price for the next 30 days – so you won’t be disappointed if you visit the same product for the rest of the month, unless you miss out on the flash sale. Some of the items you view will have coupons available from the seller. Each seller has their own “Store” within AliExpress. This is where you can find all of the items that a single AliExpress seller is listing online. To see if the seller for your item is offering any “Store Promotions”, look under the “Buy Now” and “Add to Cart” buttons on the website. If promotions are available, there will be a dropdown called “Get Seller Coupons”. The screenshot below shows an example, along with the various promotions this seller is offering shoppers. After you select “Get Now”, the coupon is loaded to your account. 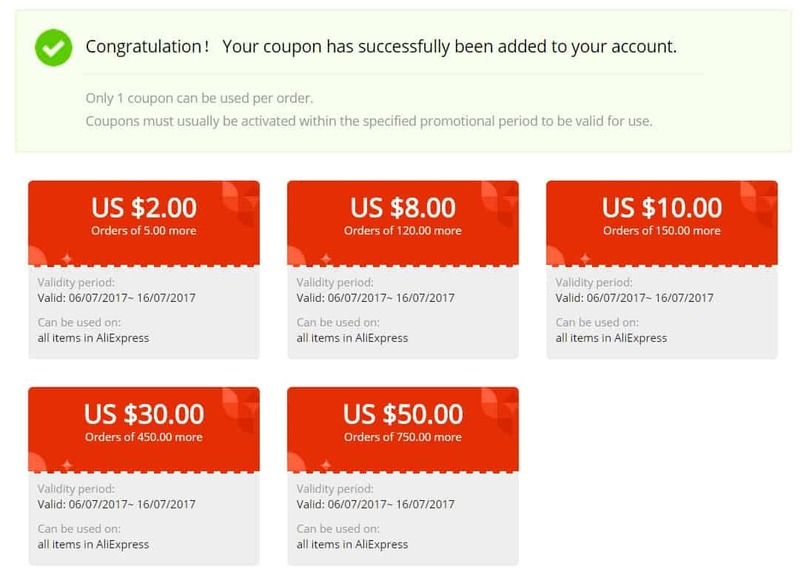 For an explanation on using coupons when checking out, take a look at the tutorial video below from AliExpress. 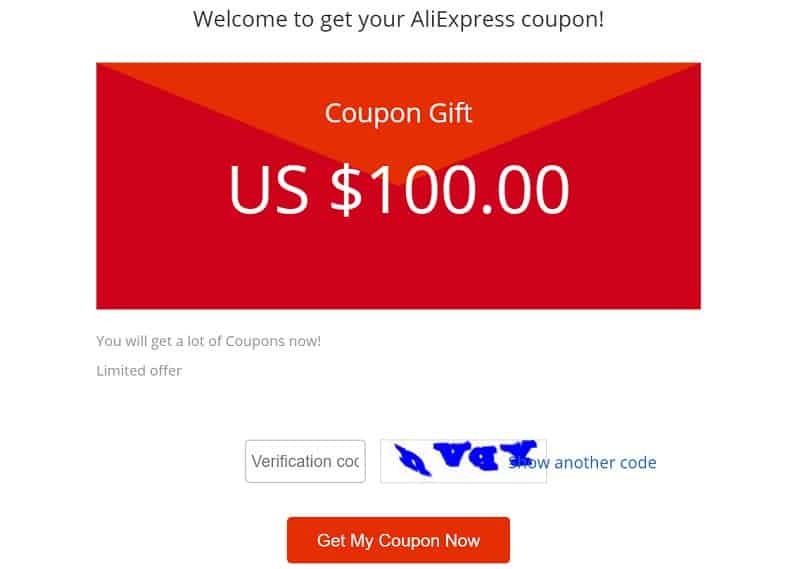 There are other sites that offer AliExpress coupons. The list below includes some of the top sites savvy shoppers use to save money when shopping online. Go to AliExpress.com, wait couple of seconds and you’ll see a coupon pop up (they may not offer this all the time). Click on “Get Your Coupons”. Verify that you are not a robot and click “Get My Coupon Now”. Go to your account and check out your coupons. AliExpress allows you to use gift cards when paying for your order. You won’t find specific AliExpress Gift Cards. However, you can use any prepaid gift card (Visa, Mastercard, American Express, etc.) to pay for your order. The only time you would not be able to use your gift card is if the card doesn’t allow international transactions. The United States changed its banking regulations in 2012 to limit the ability for gift cards issued by credit and debit card companies to be used overseas. This is a problem, because AliExpress processes their transactions locally in China. To get around this, you’ll want to ensure that you purchase prepaid cards designed to be used overseas. Almost every prepaid card that can be linked to a personal identity can be used overseas – the regulations were implemented to prevent anonymous overseas transactions (a favorite tool of money launderers). It’s always a good idea to check the cardholder terms and conditions before loading up a gift card or prepaid card – if you find out too late that it can’t be used with AliExpress and other overseas sites, it’s very difficult to get a refund. It’s always a good idea to check out the fees, along with the terms and conditions before pulling the trigger and opening a new Prepaid Debit Card. I hope you’ve found this guide helpful. I’ve brought together a lot of information (maybe more than you were looking for) into a single AliExpress guide. If you’ve made it this far, would you mind sharing your thoughts in the comments section below? If you still have questions, I would love to help! And if there’s something I forgot, I’ll be sure to update this with new information as it comes available! AliExpress has some very good quality products available at wholesale prices. I’ve been very happy with what I’ve received from them. I’ve ordered 8 items. They were good quality. One seller sent me the wrong handbag and I negotiated a 50% discount. I was happy with that. The cons are snail mail shipping, inconsistencies in quality among sellers, Asian sizing and not knowing 100% if what you are getting is what was described. I did an AliExpress haul and review of 8 products I bought (handbags & clothes). These are my honest opinions of the products and company. i’m planning to buy @ Aliexpress.